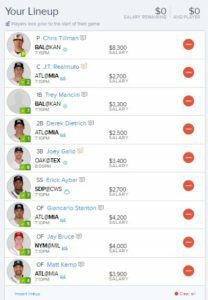 Fantasy Leagues - Page 345 of 438 - Home of free fantasy sports lineups! Chris Tillman has a great match up against the low scoring offense of the Royals tonight and should have a big start. My value pick is Trey Mancini, who could have a big night as well. My sleeper pick is Jay Bruce against the Brewers. Picks made on this site are for entertainment only. Stephen Curry is set to start the series off strong and should be able to take advantage of the Spurs injuries. 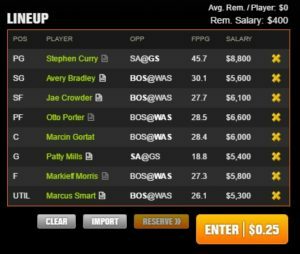 My value pick is Patty Mills, who will continue to put up solid numbers at a low salary. My sleeper pick is Otto Porter. Stephen Curry is rested and should start off the series against the Spurs strong. 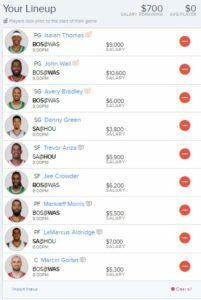 I like the role players on the Celtics to be great value plays tonight. Avery Bradley and Jae Crowder will be big contributors on the offensive side of things. My sleeper pick is Marcin Gortat, he should put up an easy double-double. Isaiah Thomas leads this lineup and lead the Celtics to a big offensive night. I also like Al Horford to step up again as well. 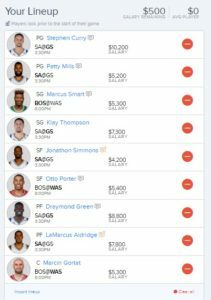 Eric Gordon is my value pick and will have another solid showing. My sleeper pick is Trevor Ariza, I think the role players will have a big night for Houston. 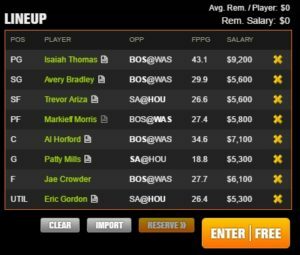 Isaiah Thomas remains the best option at PG and so does John Wall. Avery Bradley should have another great game as well. My value pick is Danny Gree, he is going to have to help the Spurs on offense, so look for a breakout game. My sleeper pick is Trevor Ariza.